In my previous article, I demonstrated how easy it is to passively monitor Linux machines with Nagios Remote Data Sender (NRDS) and Nagios XI. 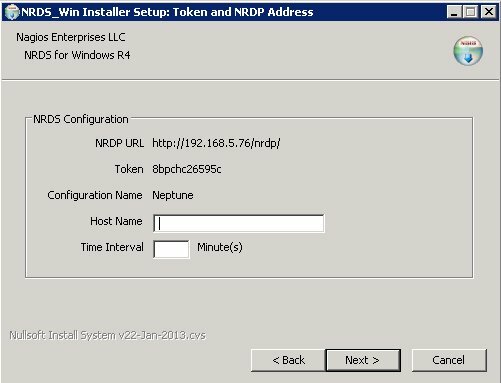 In today’s article, I will cover passive monitoring of Windows machines via NRDS. Go to Admin -> Monitoring Config -> NRDS Config Manager, click on Create Config, select Windows (32- or 64-bit) from the Operating System drop-down menu, and click on the Next button. 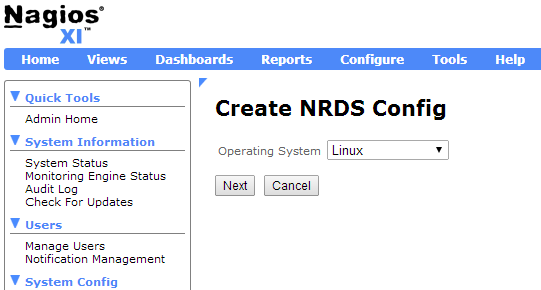 You will see the Edit NRDS Config page. Most of the config options will already be populated for you with the default options. All you will need to do is type a config name, select a token from the drop-down menu, and click on the Apply button. For this example, we will be creating a config called “Win7x64”. Category: Configuration, Nagios XI, NRDS, Passive Checks, Windows and Wizards. 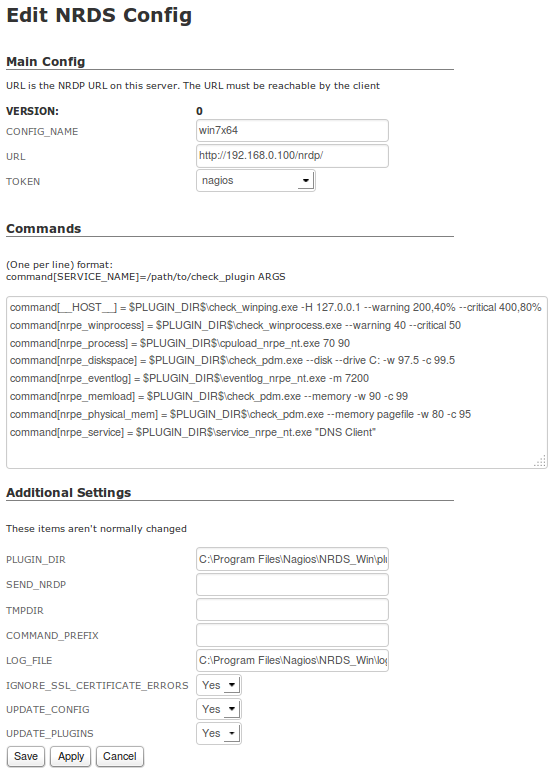 2 Comments Tags: Configuration, labs, monitoring, nagios, nagios xi, NRDS, passive checks, windows. When active agent-based monitoring is not an option (because of a firewall, or security restriction), passive monitoring can provide the solution necessary to maintain network security and health. Today we will be discussing Nagios Remote Data Sender (NRDS) and how it can monitor Linux machines using passive check results. Passive results are sent to the Nagios Remote Data Processor (NRDP) server and processed in Nagios XI. In this article, I will show you how you can start monitoring a Linux host passively in three easy steps. Go to Admin -> Monitoring Config -> NRDS Config Manager, click on Create Config, and select Linux from the Operating System drop-down menu. Category: Awesome, Configuration, Cool Stuff, Nagios XI, NRDS and Passive Checks. 1 Comment Tags: monitoring, nagios, nagios xi, NRDS, passive, passive checks. Major improvements to agent-based monitoring have been taking place at Nagios Enterprises. NCPA, the Nagios Cross-Platform Agent, is a project that has the potential to revolutionize agent-based monitoring and increase the efficiency of IT support teams world-wide. As many Nagios users know, monitoring with agents means juggling the installation of many different types of plugins to try and match devices, operating systems, and the basic functions of each agent. For example, in a simple agent-based Linux and Windows server environment you have to install 2 agents, know the 2 user manuals, there are 2 times the troubleshooting hours required, 2 times the commands on remote systems, 2 change logs to sift through for potential update breaks…the list goes on. It can be very difficult to keep organized and take a lot of time to implement and update your configuration, especially when your monitoring environment becomes larger and more complex. Whether your environment is large or small, there are usually a myriad of devices that need to be monitored and more often than not, some sort of agent needs to be installed on these devices. Wouldn’t it be simple if you only had to install one agent regardless of operating system or device? We have been working on a project that aims to do this. Nagios Cross-Platform Agent (NCPA) is a fully contained agent that runs on Mac OS X, Windows, and Linux and seeks to solve all of the previously mentioned pitfalls of agent based monitoring with Nagios. The main goal of NCPA was to monitor the core metrics of a server and other devices without the added hassle of plugins and dependencies. Metrics such as CPU Usage, Disk Usage, Memory Usage, Interface Usage, Swap Usage, User Count, etc. are preloaded in NCPA so that all you have to do is install the agent. It has since broadened in scope to be a general purpose agent that is very good at doing the aforementioned job. Just install the NCPA agent on your system, and away you go. We are very excited about this new agent and are currently looking for real world testers to try it out. To test NCPA please contact nscott@nagios.com. Thanks!